Exercise is one of the greatest gifts you can give your body and mind. Exercise helps to increase the circulation of nutrients and immune cells; it improves our strength, endurance, and flexibility; enhances our energy level; and diminishes the physiological effects of stress. In addition, exercise benefits our mental and emotional health by reducing stress and relieving anxiety and depression. Regular exercise can help protect you against several diseases, including breast cancer. According to studies conducted in the United States 9U.S. ), white women and black women who exercise regularly may be less likely than their inactive peers to develop breast cancer. For example, women who biked or walked for more than an hour each day had a 19% reduction in their odds of developing breast cancer. Some scientific evidence exists that women who exercise regularly before menopause gain lifelong benefits against breast cancer. Studies of European, Hispanic-American, Asian-American, and Asian women show that the women who have higher lifetime levels of physical activity demonstrated a lower risk of invasive breast cancer. A recent study performed in Norway showed that even moderate exercise, defined as 4 hours per week, contributed to a lower risk of breast cancer. Another recent study conducted in the U.S. demonstrated that women who exercised 3 to 5 hours per week had a lower risk of breast cancer than did women who exercised less than 1 hour per week. Regular exercise does not necessitate daily trips to the gym to ride stationary bikes or log miles on a treadmill. Any activity that helps get your blood circulating and deepens your breathing can be considered exercise�a brisk walk, active play with your children, yoga, gardening. Exercise should be enjoyable. If you do a type of exercise that you do not enjoy, chances are you will not stick to the exercise program. Many alternative forms of exercise can be used to help you achieve balance in your life and promote wellness. 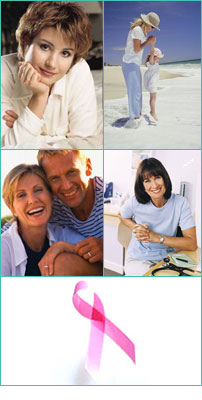 All of these activities have one thing in common�they enable you to take charge of your health. By taking responsibility, you will begin to understand how your body works and what you can do to help it function optimally. Listed below are several alternative types of exercise and their general benefits. Each of the following alternative forms of exercise offer something different physically, mentally, and spiritually. An ancient Chinese art, tai chi is best described as a moving meditation. Tai Chi combines slow, relaxed movements with deep breathing. The breathing technique promotes relaxation and enhances awareness of the body, whereas the deliberate movements develop muscle strength and endurance, flexibility, balance, and coordination. Breathing is coordinated with each movement to cultivate �chi� (�breath-energy� or �life energy�) through the body. According to Chinese philosophy, optimal health depends on unobstructed flow of life energy through the body. If the energy channels become blocked, both the body and the mind suffer. Tai Chi aims to keep chi flowing freely. Because of its low impact aerobic nature, tai chi is an excellent choice for older women who may not be physically able to participate in more high-impact aerobic activities. Many different �types� of yoga�Ashtanga, Iyengar, Bikram, etc. � are practiced. Despite the different approaches, all yoga practices use a series of different postures to promote physical health, mental balance, and longevity. The different postures have a variety of effects on the body. Some poses are energizing. Other poses are calming and may even promote sleep. The philosophy of yoga is that life�s pressures need to be balanced with quiet, thoughtful time. Although yoga strengthens the body and improves both flexibility and endurance, yoga also develops the mind-body connection by demanding concentration on the body and breathing. The ability to control one�s breathing enhances self-awareness and the ability to create �quiet� time. Joseph Pilates, who designed this form of training, believed that ideal fitness is "the attainment and maintenance of a uniformly developed body with a sound mind that is fully capable of naturally and easily performing daily tasks with zest and pleasure." Pilates exercise teaches the individual to move from the body's center. In the Pilates exercises, a variety of different equipment that was developed to build muscle strength and endurance, as well as enhance awareness of the body, is utilized.